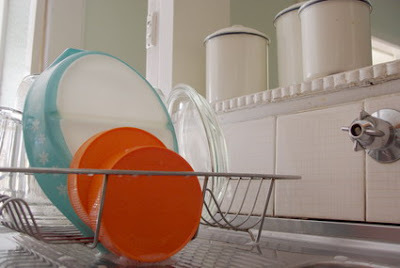 IT’S getting pretty desperate in the blogging stakes when you’re picking up the camera to photograph the washing up. Hey, don’t judge me. At least I have clean dishes. The old Bushells coffee jars were $1 each. I thought they were Tang jars – who remembers Tang - but on reaching back into my archive of product packaging I think I do recall the Bushells brand having the same coloured orange-topped jars. Almost all my pantry containers are large glass coffee jars. It’s a shame they don’t come like that anymore. I know it’s all about reducing the freight weight but those jars sure encouraged customer loyalty. You just had to keep drinking the stuff so you could house the bread crumbs, flours, coconut, sugar ... I could go on. What’s your pantry storage system? Tang! What a blast from the past! I like the Moccona(?) coffee glass jars. Oh I just love deep orange and that shade of blue together. Great buys! Ah pyrex! Love that pattern. My pantry storage system is a mix of thrifted Tupperware, Brabantia and random tins. Oh show me where the pyrex are in the Op Shops!! I hardly ever see them. I have a huge jar collection growing below my sink but they are mainly pasta sauce jars. My pantry storage is pretty lame - mostly a peg to hold the bag together. LOVE that blue on the Pyrex! Haven't seen one in that colour before! If you want to get rid of it someday, I volunteer to give it a good home. I'm starting to get a collection of baby formula tins in my pantry, but they are coming in handy for my house painting jobs. I use Moccona glass coffee jars too. I also have some lovely big glass jars with metal lids from the 1940s and 1950s. There's also the odd packet with a peg attached!